Stir in oats, flour, baking soda, baking powder and salt until dough forms. Stir in chocolate chips and cherries. Drop dough by slightly rounded tablespoonfuls 2 inches apart onto ungreased cookie sheets. Bake 8 to 10 minutes or until edges are golden brown and tops look set. Cool 2 minutes on cookie sheets. Remove to cooling rack; cool completely. Store in tightly covered container. Always read labels to make sure each recipe ingredient is vegan. Products and ingredient sources can change. Quick-cooking oats can be substituted for the old-fashioned oats called for in this recipe. Coconut oil comes in two varieties: virgin and refined. Virgin coconut oil is made using a cold-press process and retains more coconut flavor. Refined oil is more processed and is odorless and flavor-free. Melt your coconut oil after you’ve measured it. 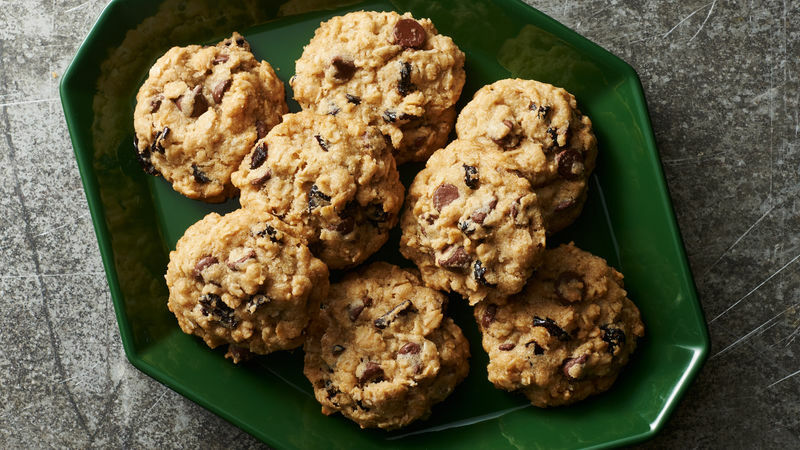 Vegan chocolate chips are often found in the organic section in the baking aisle at the grocery store.